Addis Ababa, April 17, 2016 (FBC) – The Ethiopian defense force has intensified its military operation to free children abducted from Gambella regional state last Friday, Government Communication Affairs Office (GCAO) said. Armed Murle tribe from South Sudan massacred 208 innocent civilians and kidnapped 100 children, including those killed and abducted since last month. They also looted over 2,000 cattle. According to GCAO’s statement, last Friday’s attack was occurred in 13 kebeles (villages) in Anuak and Nuer zones of the regional state. 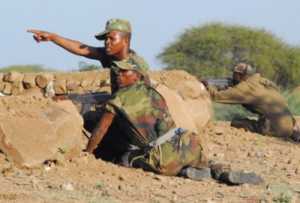 The Ethiopian defense force has so far killed over 60 attackers as well as captured 11 weapons, including a machine gun, the office said. A medical team has been dispatched to treat the civilians wounded in the attack. The government of Ethiopia expressed its deep sorrow over the killing of civilians by the armed militant group.